« A weekend of blessings! Who knew it would take a year to complete this project?! 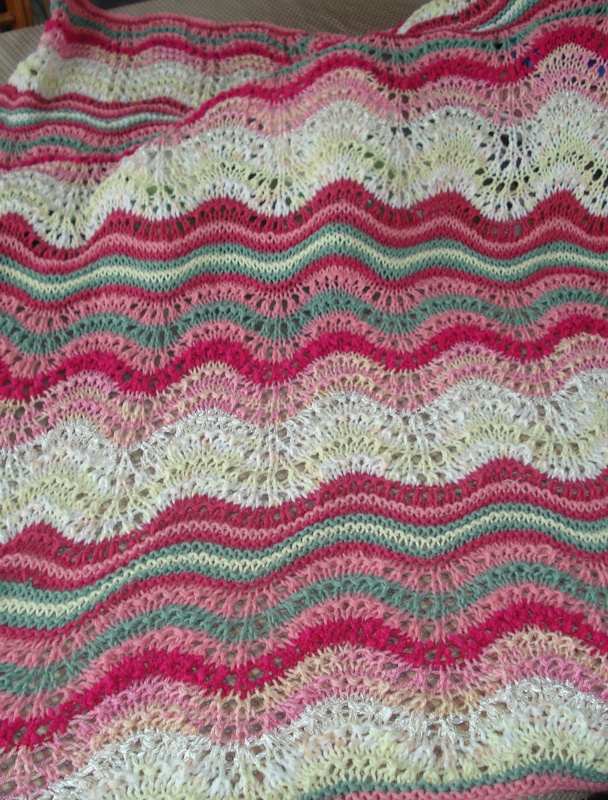 I started an afghan for my grand-niece Betsy shortly after she graduated from high school – May 2010 – her graduation present. We chose the kit of colors that we thought we both liked. I started it…put it aside because I wasn’t having a “love affair” with the yarn and then Betsy’s mom (my niece) and I decided that the colors weren’t quite right… I also decided to knit the twirly skirts for my three very young nieces of the first generation….that was going to be for Christmas and I think those became a late Valentine’s present…looking back I now see it was April. My dreams of what I can accomplish are greater than the number of hours in the day. However, I will continue to strive to “feed” my knitting dreams!! I think I knit a hat or two along the way…and helped my knitting clients with some of their knitting dilemas. My goal in choosing yarns for Betsy’s afghan was not only color but fiber that would be pleasing to touch and easy care. Most of the yarn in this project was Brown Sheep’s Cotton Fleece and MaggiKnit’s Cotton (both available online at Skein Lane’s on-line store). Two other yarns were used – one a hand-dyed cotton from Black Mountain Artisans and the other an “unknown” ribbon yarn. This was a very fun project and I think I should start now for Betsy’s college graduation present! In the meantime there are three other special family events during Betsy’s college years….Chloe graduates in two weeks (I don’t think I’m ready! ), Daniel and Shelby graduate in the next couple years….and Sam isn’t far behind! I’m clicking those needles….oh do I hear the steps of the younger children not far behind….Isabella, Jade, Abygail, and Carson…..oh click those needles! I am reminding myself of all the quilts my grandmother Alta quilted for so many of us. Stay tuned for more of Grandma Alta’s quilts. It is beautiful Carolyn, you’re very talented. You’ve put a lot of time into making it and the results speak for themself! I like the colours you’ve used and the pattern. I’ve got a very clever Cousin.